It’s late August, 2002, and I’m sitting at my desk at Pala International’s headquarters trying to get ready for my first trip to Russia in three years. When Adoree Comer, a longtime employee sees me, she says: “Oh, don’t you think you are so lucky… all these travels all over the globe and you have never had one crash!” Well Adoree… I think that’s the idea… one crash is probably one too many. Tranquility shattered, for the rest of the day I’m nervous because it’s my first time flying Aeroflot from Los Angeles to Moscow. But—damn the torpedoes—somebody has to do it. Why, you ask? Because the reds have just dug up what promises to be one of biggest finds of green in a century. Green as in demantoid garnet, imperial gem of Fabergé and the Czars. Arriving at the airport, I am wondering what kind of plane Aeroflot will have given me for my first trans-Atlantic venture on the airline with a less-than-stellar rep. At the terminal I see the signs for Aeroflot and go to the appropriate section—but there is no Aeroflot. A security guard points me back into the “B” area—not a good sign as Aeroflot on all the billboards still says it’s located where I am. But sure enough, when I get to the “B” area, I find the counter and check-in. Having completed my last rites, I proceed to security, where I’m immediately singled out for the training of a new recruit. As I sit in my socks while my footwear is shuttled back and forth through some high-tech electronic shoe sniffer, the trainee scrunches up his face in puzzlement while his supervisor describes the proper way to sniff a shoe. This takes a lot of time. Finally it hits me: the main lesson is simply: “This takes a lot of time.” The conclusion? I should have used more talcum powder. Welcome to travel in the Land of the Free. After a proper waiting period my nervousness is creeping back. The flight is called. Striding down the air bridge, I catch sight of the airplane’s skin. It has a certain rustic, hand-made quality to it, as I expect all Russian planes are. While there is Cyrillic lettering, I can’t tell what kind of plane it is. I look at the floor to see if the carpet is threadbare. Nope, plenty of carpet. I notice there are two seats, with three center seats, then two seats—typical design. The overhead bins seem quite small, but the chairs look hard and I confirm this when I take mine. Stewardesses take their positions for safety and I continue to wonder if this might be the infamous Tupolev, or an even more nefarious brand of jet. In the middle of their Russian I catch the phrase “boing sivain sish sivain.” I pull out the safety instruction card, and—sure enough—find that I’m seated on a late-model Boeing 767. I laugh at myself, and then settle back for an uneventful 13-hour flight. The video blinks and flickers throughout. Nobody tries to fix it, something in which I take comfort. It just feelsmore like flying Aeroflot should. Endless forests surround Russia’s storied Ural Mountain demantoid mines. When we land, everyone claps and I’m not quite sure whether or not I should join in. I make it through customs uneventfully—in fact, not even looked at. Of course, I don’t have a single mineral specimen on me, although I am bringing in several oyster shells so that Nickolai can give them to a Russian project considering culturing pearls in Baja California. When I arrive in the lounge everyone is waiving to their people as they come through and there is no Nick. I get hustled by an aggressive taxi guy saying that: “If your ride isn’t here, he isn’t coming.” Perhaps the news of my demise preceded my arrival? The next day, our first stop in Moscow was Stoneflower, Nickolai’s mineral and gem company, housed in Andreievsky Monastery, which dates to the 16th century. At the company, which employs perhaps twenty people, I greet my old friends Misha, Anton and, of course, Sasha, who runs the teams. He relates that they have a good project in Kazakhstan for quartz and apatite and also shows me this year’s production of rutile and epidote. He says the best things have already been shipped to Denver. I’ll get to see them there. The day slips away rapidly and at 4 pm we leave for a small lake by the Moscow River, where they have been preparing a barbeque for all the Stoneflower people. They have a party just about every Saturday, and there is wonderful veal being grilled with vegetables. An eggplant with chilies is being created and barbequed by Sasha. Nick has brought a large midsection of the sturgeon. All the meats and fishes are done au brouche, we are drinking a little vodka, Russian wine and it’s quite a jovial feast. Perhaps twenty guys and two of them have brought their wives. We leave at a respectable hour. Nicky doesn’t drink, because he says: “Driving now in Moscow, you have to be careful—just like in America.” We go home, take a sauna and know that tomorrow we will be flying Ural Airways to Ekaterinburg. The following day, after an uneventful flight on a giant EIL88, we are met at Ekaterinburg’s airport by Nick’s partner, Vadim, and drive to one of the large business factories that have been privatized from the state. It is quite impressive—they are building autoclaves and all sorts of oil technologies here. They are also involved in the development of the Klodovka Mine. The mine’s gem production is explained. We drive to Vadim’s office where he has a gemologist sorting and I must say it’s truly impressive—perhaps 30 kg of material—of which almost 1 kg will cut over one-carat stones each. There are wonderful natural nodules coming from these aggregates in what they call a vein—it’s probably a metamorphic contact or a slickenside. The colors vary somewhat but the finest are extraordinary and after cutting will yield over three-carat stones in some instances. All in all, it’s a finer production than I saw in our entire time at Korkordino Mine. We make arrangements for visiting the mine tomorrow, on Friday. They ask what kind of a barbeque we would like up there. We tell them our preferences and go back for a sauna and a fairly early evening with great excitement of visiting the oldest producing demantoid mine in Russia. On Friday, shortly after breakfast, Vadim, the mine manager, meets us. It is a bit of a gray day over Ekaterinburg and we are taking two cars—Nick and I are in the 320 Mercedes, which gives me sort of an unreal feeling. The second car is appropriately a Lada and I feel much happier. The two-hour drive is through some charming villages, most of which are wooden with beautifully painted shutters and tin roofs. There are large stances of virgin forest between them. There are some small hills completely covered in pines and birches—the undergrowth is dense and one wonders how anything is ever found geologically. We enter the city of Klodovka and I’m informed that it is perhaps 10 km to the mine; however, the road is extremely rough and will take perhaps thirty minutes of this two-hour journey. The landscape quickly morphs into densely overgrown forest swampland. The road is filled with large pools of water every 100 ft. or so—large meaning up to 20 ft. across and perhaps 1 ft. deep. We navigate it slowly, but without incident. Just before we reach the mine a group of four of the miners are coming out of the forest. They have been prospecting for continuations of the demantoid vein while awaiting our arrival. 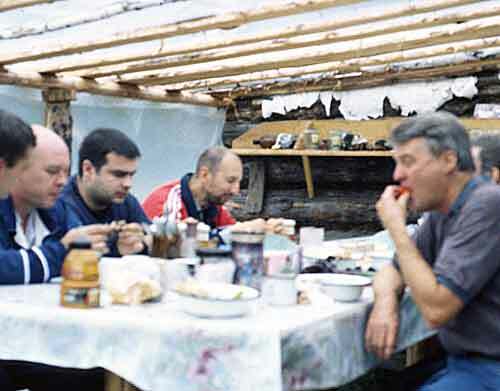 There is a camp set up with two very large, old military looking trailers painted a dull green, and a camp created with posts and plastic, along with the all-important banya (sauna) for relaxation in the evenings. The mining season is short—just three to four months—and it’s only in the last two weeks that the insect population has come down to normal. They show me in the areas near the ceilings entrapped insects, including biting flies and mosquitoes, where 10,000 plus of these nasty pests have entrapped themselves. It’s unbelievable. During the height of the season, when cars first stop they are completely swarmed with insects drawn to the heat. There is still a buzzing around all of us, but none of us are getting bitten too badly so I’m very fortunate to have picked this time. It is later in the afternoon and the sun makes it first real appearance—I suggest we go to take pictures of the mine while the light is good. We hike through the dense growth on a small path with lots of open water. After perhaps a quarter of a mile we come across a very large pit, perhaps 0.5 x 0.5 km, which has been gouged out of the shallow hillside by various back, hoes and manual labor. Up to six miners have been working throughout the summer. 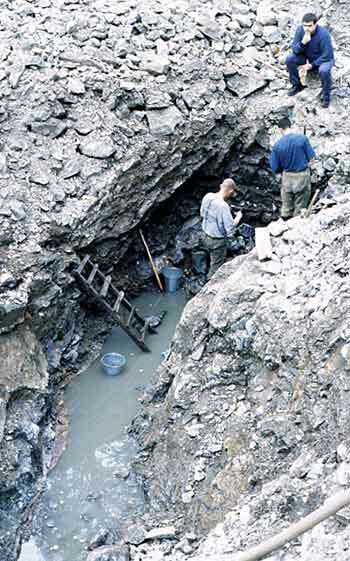 It was at this very site that demantoid was first found last century. 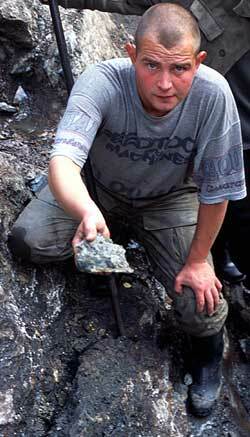 Indeed, researching that historic discovery is what led Vadim and his team here. I see many crosscuts along the way, and I am told that exploration started in May. By July, they were on the verge of giving up. Then, Mother Russia decided to give her sons a little treasure. The workers exposed a vein and soon green Ural pearls were being unearthed in unheard-of quantities. It was only by the narrowest of luck that the discovery was remade. The work has exposed the vein, however, in one section where I see it. The vein appears to be almost like a slickenside along either side of a fault zone. Or perhaps it’s a metamorphic contact, but the zone that contains the demantoid varies between one inch, up to two feet in this gouged area in the serpentine. The garnets have formed in crystals and aggregates, the best pieces being isolated in lines of nodules within the serpentine, glistening out like green, polished tears. These are up to a quarter inch in diameter, most of them being perhaps only 2–3 mm, but varying in color from light green to dark green. At the mine there is a simple pump, which keeps the water level down. At the time of my visit, the main work is being performed by two strong young Russian men with pry bars, sledgehammers and chisels. They are removing an 8–10 inch section of serpentine. Here, in the middle of this virgin forest is this pit of serpentine going down perhaps 40 ft. in total depth. The miners motion Nickolai and I down for closer examination of what they are doing. We try to capture the feeling of the moment on film, and there is certainly excitement with the mine owners picking up and examining some of the latest finds. Above the pit, pea-sized pieces of demantoid are scattered across a piece of canvas in a spectacular display of newly dug treasure. We marvel at the scene, turning beautiful, crystal-clean demantoids in our fingers. The likes of this have hardly been seen since the time of the Czars. As a few of the rocks are broken up, nodules of an extraordinary green color are revealed—some of which will cut up to two-carat stones. I shoot three rolls of film over the next forty minutes and Nickolai does the same. At the end, as the last sunlight fades, we retire to camp, where a barbeque has already begun. We take several fine demantoid samples back, and display them like hunting trophies on the dinner table, amidst the vodka, meat and vegetables. Yes, I will definitely be back for more. All in all, it is one of my most memorable days in prospecting. Introduction/Name. 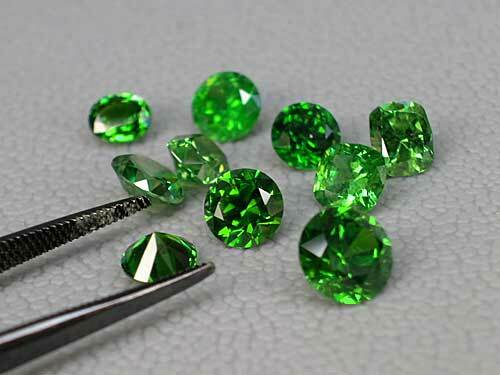 Demantoid is the name given to the rich green variety of andradite garnet. The gem was first discovered in Russia and the name is derived from its diamond-like adamantine luster. Color. While the color of demantoid never equals that of the finest emerald, an emerald-green is the ideal. The color should be as intense as possible, without being overly dark or yellowish green. The color of demantoid is believed to be due to chromium. 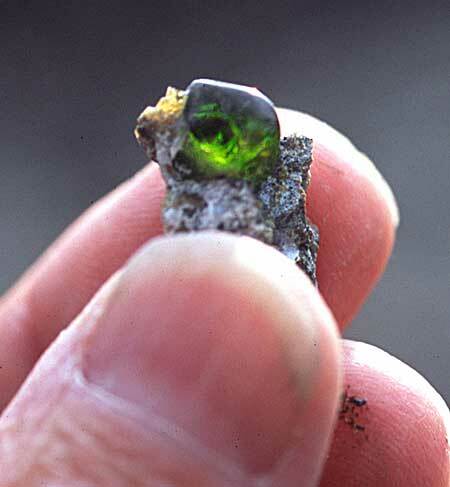 It should be noted that demantoid’s fire is best seen in the lighter, less saturate gems. Thus the color preference is a matter of individual taste. Some people will choose an intense body color and less fire, while others prefer a lighter body color and more fire. Lighting. 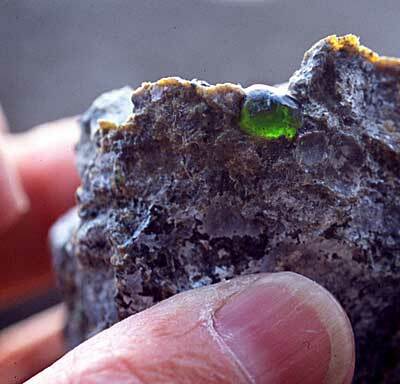 Demantoid garnet generally looks best under daylight. Incandescent light makes it appear slightly more yellowish green. Because of its high dispersion, demantoid looks great in the same type of lighting as diamond, i.e., multi-point (as opposed to diffuse) lighting. Cut. 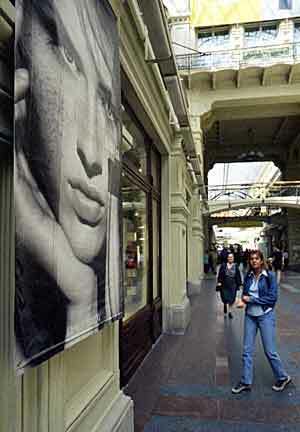 In the market, demantoids are found mainly as round brilliant or cushion cuts. Cabochon-cut demantoids are not often seen. Prices. Demantoid is among the most expensive of all garnets, with prices similar to those fetched by fine tsavorite (the other green garnet). But like all gem materials, low-quality (i.e., non-gem quality) pieces may be available for a few dollars per carat. Such stones are generally not clean enough to facet. 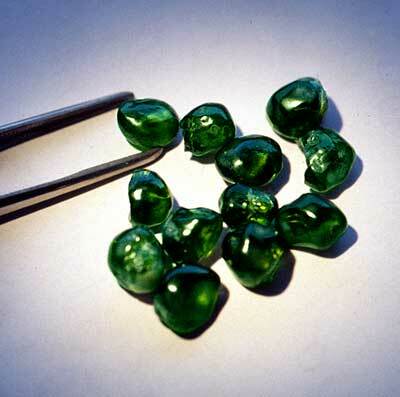 Prices for demantoid vary greatly according to size and quality. At the top retail end, they may reach as much as US$10,000 per carat. Stone Sizes. Demantoid is rare in faceted stones above 2 cts. Fine demantoids above 5 carats can be considered world-class pieces. Most stones tend to be less than 1 ct.
Sources. The original locality for demantoid was in Russia’s Ural Mountains. Today, deposits of lesser material exist in Iran, Italy and Namibia, but the Russian material remains the standard by which the gem is judged. Enhancements. Some demantoid garnet is heat-treated to improve the color. The resulting stones are stable under normal wearing conditions. Imitations. 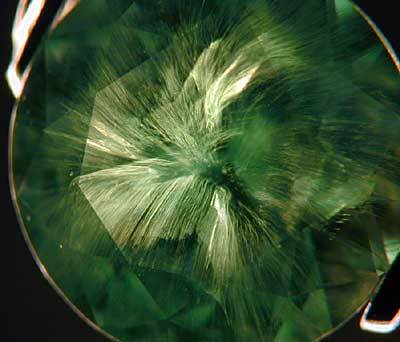 Demantoid garnet has never been synthesized, but a number of imitations exist. These include green glass and green YAG. The best way to care for demantoid garnet is to clean it with warm, soapy water. 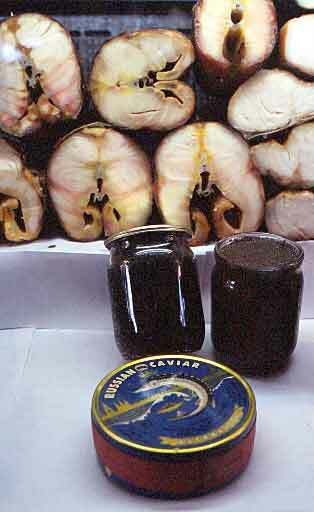 Avoid exposing it to heat or acids. 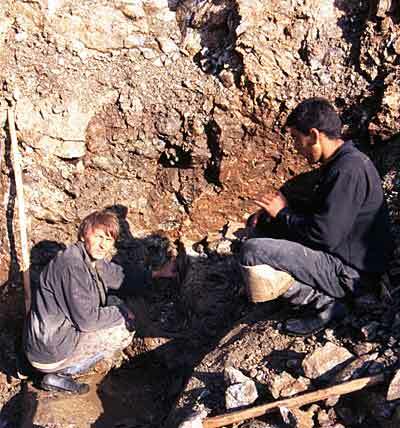 For more on Russia’s demantoid mines, see Gabrièl Mattice’s Gem Spectrum Newsletter, Vol. 4, No. 1.